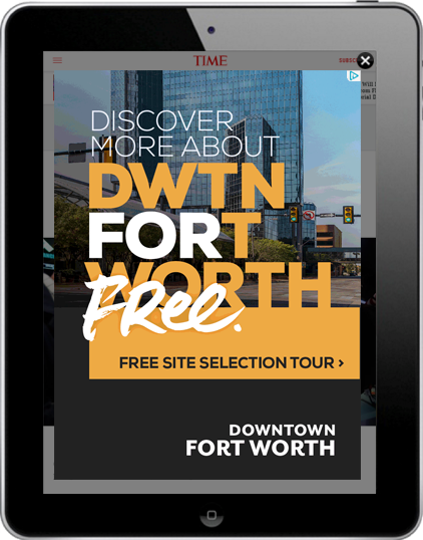 Downtown Fort Worth, Inc. (DFWI) and downtown high-rise office building owners have partnered to launch a digital marketing campaign directed to out-of-market corporate location decision makers. DFWI hired the Balcom Agency with Public Improvement District funding approved by the Fort Worth City Council for the campaign research and creative messaging development. Office building owners have funded the purchase of digital ads in select markets. The campaign will increase awareness of downtown Fort Worth as an attractive and competitive corporate location in Texas. “The goal is to deliver Downtown Fort Worth ads to corporate decision makers in markets that have exported businesses to DFW in recent years,” said DFWI President, Andy Taft. “Downtown property owners came together in this unique collaboration to build a megaphone to tell the downtown story. This is the start of a multi-year effort to increase downtown’s national brand and availability awareness,” said Johnny Campbell, President of Sundance Square. The campaign features Fort Worth’s business friendly environment and highlights reasons for relocating here. Top attributes include our work force, access to DFW airport, abundance of office options and our beautiful, walkable downtown. Sundance Square, Red Oak Realty, 777 Main, TIER REIT, and Anthracite Realty Partners funded the ad campaign’s first phase. The Fort Worth Chamber of Commerce is participating though lead servicing assistance. In the early 1980s, Fort Worth began the urban revitalization of its downtown central business district aided by a private sector voice, DFWI. A group of dedicated downtown property owners established DFWI in December of 1981. This membership-based, 501(c)(6) organization has evolved into a significant champion for progress and excellence in downtown Fort Worth. DFWI manages the Downtown PID.